See how they run. This no frills, Indonesian-built fisho is worth a second look. There was only one Marathon 33 at the Sanctuary Cove International Boat Show, and it almost slipped under the radar among the other boats on the marina. As it turns out, the Marathon 33 is the first Indonesian-built boat to appear at the show, which is a little surprising, given that the country is made up of more than 2000 islands. The sea and fishing are a central part of life. But it seems that much of the boat building is done in the coastal villages, using traditional methods, rather than by big industry using modern design and construction methods. Marathon Pacific Marines was set up in Jakarta about 10 years ago by naval architect Brian Halim, an Aussie with an Indonesian background. It’s probably no coincidence then that the Marathon 33 has a hint of the traditional Indonesian fishing boat about it – especially in the shape of the bow and the narrow length to beam ratio. There are no frills about the Marathon. It’s a simple fishing platform with a working cockpit that measures 2.9m x 2.6m with nothing to jag lines on – except the two outboards. But there’s a solution to this problem. A flat section with footrests has been moulded into the aft ends of the gunwales, so a couple of people can sit down and fish over the back without catching the outboards. This may be all right in smooth water, but it would be a bit hairy offshore. There is plenty of storage in the 600mm-high gunwales, but there are no toe kicks for support when leaning over to bring a fish onboard. Access to a kill tank that will take a fair sized fish, a live bait tank, the 1500lt fuel tank and a 200lt water tank is beneath the floor. In a typical Moreton Bay chop, once up on the plane the boat stays dry. The cockpit is similarly dry, due to a small flare moulded into the sides of the hull to deflect the water away. The cockpit floor is also kept dry by two non-return ball valves in the transom. In keeping with the ‘no frills’ philosophy, the driver and companion get to sit on a couple of bench seats. Any other passengers who are along for the day get a couple of bench seats either side of the cabin. 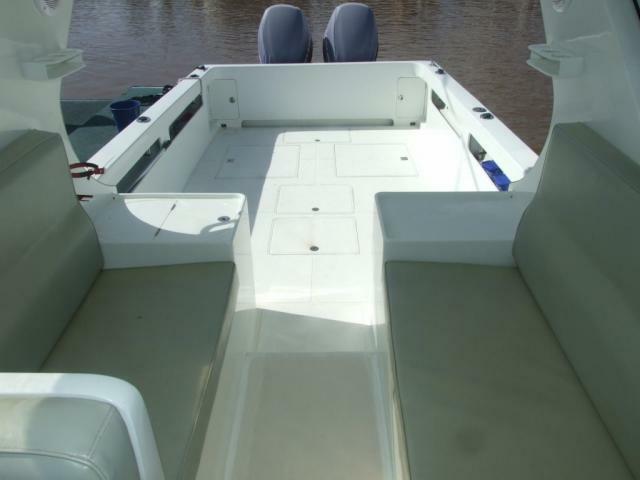 The boat comes with basic floatation, but to achieve this the storage space under the seats has been sacrificed. A solid stainless steel frame supports the hardtop, with the standard rocket launchers at the back. Handholds leave a gap between the windscreen and the top, which is filled with clears. The helm console contains the standard outboard instruments in a burl wood accent with room for a VHF radio and a small plotter and sounder in front of the driver. This one has a Garmin 292 plotter and a Furuno FCV 620 sounder flush mounted. An overhead shelf has been provided for charts and other odds and ends. It is possible for an average man to stand up at the helm and look over the windscreen. Taller blokes would have some difficulty so to make room for them the hardtop will be raised another 75mm on future boats. The lock-up cabin up front comes with a Porta Potti hidden beneath one of the cushions of the vee-berth. It’s not a cabin you would want to spend too much time in, rather a place to throw the bags and jackets out of the way. The boat is powered by a couple of 250hp Suzuki outboards, but because of the narrow beam they are set a mere 25in apart, which is too close. They can’t be used one forward and the other astern to manoeuvre the boat in a tight marina situation – it won’t turn. The boat has to be handled like any other single outboard boat, so it’s just as easy to manoeuvre with one outboard and the wheel and leave the other one in neutral. Also, because of the narrow beam the boat needs trim tabs to keep it level when running – especially with a side wind or swell. The outboards first need to be trimmed and then the boat leveled with the tabs. It takes a little finesse at first – get too heavy handed and you will be chasing the trim all over the place with a resulting “Oops!” Take your time and it will all come together. On the performance side, the 250hp Suzuki outboards will send the boat along at a steady 25 knots with 4200rpm on the clock with the outboards trimmed out about a quarter and the tabs levelled. The Bennett LED gauge is a great help here. In full flight the GPS registers 37.5 knots at 6200rpm and although the boat is rated to 600hp the twin 250s are more than enough. Once on the plane the hydraulic steering feels fine, but at slow trolling speeds and in 6-knot zones it is a little heavy and tends to wander. Lose an engine – which is unlikely these days unless you’ve done something drastic – and the boat will limp home at 12 knots on one. Marathon 33s are built to order and the package we tested is priced at $239,000. This includes outriggers, which were still on the way at the time of the test.